This time last year we were basking in a mini heat-wave, this year we are sheltering from ice wind and the snow is falling. We could just moan about the snow and the cold but rather than be pessimistic I wondered if we could pull out some benefits to snow, to make us all feel a bit better about the unseasonal cold. Look up at the roofs in your street, any that don’t have good loft insulation will have little or no snow on them, and they may also be covered in birds who are taking advantage of the heat that is rising through the roof tiles. If this house belongs to you, it is time to increase your loft insulation. This time last year we were basking in a mini heat-wave, this year we are sheltering from ice wind and the snow is falling. We could just moan about the snow and the cold but rather than be pessimistic I wondered if we could pull out some benefits to snow, to make us all feel a bit better about the unseasonal cold. 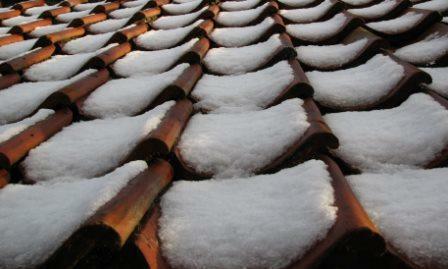 If you have snow on your roof you know your house is properly insulated. Look up at the roofs in your street, any that don’t have good loft insulation will have little or no snow on them, and they may also be covered in birds who are taking advantage of the heat that rising through the roof tiles. Snow insulates the ground While this seems counter-intuitive snow actually protects the root system of plants and trees from freezing solid. As the weather gets colder the soil will freeze deeper underground without the insulating benefits of the layer of snow. Other plants to benefit from snow are bulbs and perennials because the snow helps to regulate the temperature protecting the plants from freeze thaw cycles. The action of freezing and thawing can be very destructive because as the water thaws it expands, this constant freezing and expansion can rupture plant cells. You can help to create the same insulating effect by mulching around plants in the autumn, which is much more reliable way for protecting plants in the UK where temperatures can fluctuate wildly and we cannot be guaranteed to get snow at the right time and in the right quantities. Snow looks pretty One final benefit of snow is visual, everything looks pretty and clean in the snow. Your garden is instantly transformed into a winter wonderland. Bare branches of dogwoods and other decorative species really sing out against the snow and evergreens look greener and more attractive. See how to insulate your loft in our projects section. While this seems counter-intuitive, snow actually protects the root systems of plants and trees from freezing solid. As the weather gets colder the soil will freeze, and the colder it gets the deeper underground that freezing will go, without the insulating benefits of the layer of snow. Bulbs and perennials benefit from snow because it helps to regulate the temperature, protecting the plants from freeze thaw cycles. The action of freezing and thawing can be very destructive to plants, because as the water thaws it expands, this constant freezing and expansion can rupture plant cells. Incidentally you can help to create the same insulating effect by mulching around plants in the autumn, which is much more reliable way for protecting plants in the UK, where temperatures can fluctuate wildly, and we cannot be guaranteed to get snow at the right time and in the right quantities to protect our plants. One final benefit of snow is visual: Everything looks pretty and clean in the snow. Your garden is instantly transformed into a winter wonderland. Bare branches of dogwoods and other decorative species really sing out against the snow, and evergreens look greener and more attractive. So look out of the window and enjoy the snow this weekend knowing it is protecting your garden. DIY Doctor is working on a new gardening section at the moment – we plan to publish the first in the series this April, and as always we will be adding new content regularly. We would be happy to hear your suggestions if you have a particular gardening subject you want to hear about. Nip over to our Facebook page and leave you messages there, leave a comment on this blog or email us.